Instead of a December monthly roundup, we thought why not recap the whole year on social? Our highlights included Asbestos Awareness Week, Mesothelioma Awareness Day, tons of inspirational images that engaged our readers, as well as various news stories on cancer therapies and videos of alternative therapies like reflexology. We also end 2013 with a wish list of things we hope to see in the coming year. Here are the top three posts from Facebook and Twitter, a new community question and answer section with our registered nurse and patient advocate, Karen Selby; the most viewed videos and our wishes for 2014. 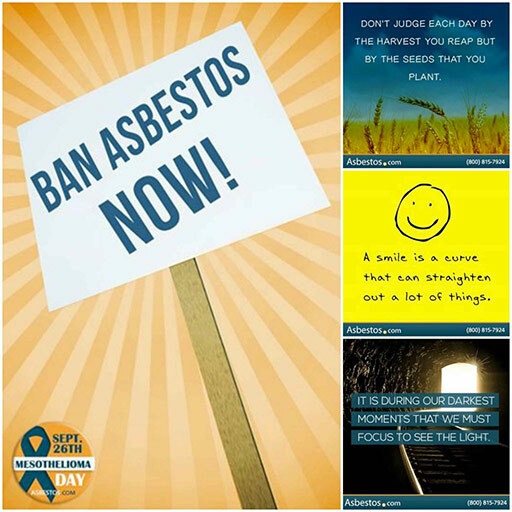 Asbestos Awareness Week: We asked you all to share images of your loved ones affected by asbestos and were overwhelmed with the response we received. Your images were combined and placed in an album on Facebook so that anyone who visits our page will see the faces of those affected by asbestos. We also provided our Facebook community with daily asbestos facts to help raise awareness about the dangerous mineral and illnesses related to it. The virtual march that we held on April 3 featured an image that was shared on Facebook by more than 300 of our followers. 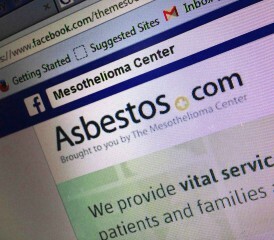 Facebook profile pictures to help show support for those who affected by mesothelioma around the world. Our veterans counselor and patient advocates and were interviewed, and their words of wisdom and advice were also shared. Inspirational Images: You guys really loved our images this year. We devote plenty of time each week looking for images that we think will provide positive thoughts for our Facebook community. We want our space on Facebook to be encouraging and supportive for those who choose to visit it, and try to select images that most people can identify with. We started the year off with an inspirational story that carried throughout the year. Our community is obsessed with finding out as much as they can on the Budwig Protocol which has been helping mesothelioma survivor, James Broomer. Everyone loved the story of how Heather Hoffman-Blois refused to let her peritoneal mesothelioma diagnosis dampen the outdoor adventures she moved to Colorado to enjoy. People found hope in the possibility that the combination of conventional cancer therapy and traditional chinese medicine could improve treatment results. Leading the charge is a recipe video for the Budwig Shake by Faith Franz, our Health and Wellness blogger. It’s not a surprise that this video topped the list. The third and final installment of our Journey of an Asbestos Fiber video series. This video illustrated how an asbestos fiber travels through the body, lodges in the lungs among other areas of the body and develops into mesothelioma or another asbestos-related disease. This year we were all about alternative therapies, and our social media community loved Faith’s video on reflexology. She gave easy-to-follow instructions on working your reflexology pressure points to help alleviate the side effects of treatment. First, it’s important to remember that not everyone who was exposed to asbestos will get an asbestos-related disease like mesothelioma. That being said, a chest X-ray can be used for diagnosing mesothelioma, and is normally the first diagnostic test run. However, it’s not 100 percent accurate. A better diagnostic test would be a CT scan of the chest. This would more clearly show pleural plaque or thickening. Unfortunately, I can’t give you a cut and dry answer. It could really be due to any number of factors. For example, it could be due to the body’s metabolism changing or the body has become immune to the chemotherapy, making it less effective. If that is the case, it’s time to try a new treatment. All of this should, of course, be discussed with your oncologist. always doing research and clinical trials. New options are becoming available all the time. Colleen Van Onselen asks, “Why do doctors not do something about seeding? My peritoneal mesothelioma was under control. My last CT scan showed regression of the mesothelioma. Now suddenly, I have days to weeks left again due to enormous growths? Doctors are aware that seeding happens, but it’s not usually a large area of concern, also there is very little they can do to prevent it from happening. When new growths development, it’s difficult to tell whether or not it’s a development of the existing disease or a result of the seeding. Yes, there is immunotherapy available for mesothelioma patients at quite a few facilities. They are all in the research phase still, but will accept patients. Getting in on the immunotherapy trials depends on your specific diagnosis and stage of mesothelioma. Contact me or our patient advocate for more information on getting immunotherapy. Greater outreach about Asbestos Awareness Week and Mesothelioma Awareness Day. More events or fundraisers in the name of mesothelioma awareness and research. Nadia Persaud joined the Mesothelioma Center in 2011 as the Social Media Community Analyst. She is excited to be spreading awareness about asbestos safety and new developments in the industry with our online community.